Obama administration officials say they plan to reject Congressional efforts to limit the president's options on Guantanamo, setting the stage for a confrontation between the president and the new Congress on an issue that has been politically divisive since Inauguration Day. The Guantanamo provisions, which include limits on where and how prisoners can be tried, were attached to a spending bill for military pay and benefits approved by Congress late last year. Some Administration officials are recommending that President Obama sign the spending bill and then issue a "signing statement" challenging at least some of the Guantanamo provisions as intrusions on his constitutional authority. Others have recommended that he express opposition to the Guantanamo sections without addressing their constitutionality. The statement, officials said, would likely be released along with a new executive order that outlined review procedures for some -- but not all -- of the 174 Guantanamo prisoners still held without charge or trial. Obama has used signing statements in the past, but this one would carry political significance as the first test of his relationship with a Congress in which the House is firmly in Republican control. Officials said the White House is still weighing how to calibrate the signing statement. A statement rejecting all of the bill's Guantanamo provisions would almost certainly be viewed as provocative by Congressional Republicans and some Democrats. But administration officials view the provisions as clear encroachments on the president's right to prosecutorial discretion and some are pushing for their blanket repudiation. The reliance on detention orders and a signing statement -- tools used repeatedly by former President Bush, who built Guantanamo nearly a decade ago -- is seen by Obama's advisers as among the few options left for an administration that has watched the steady erosion of its first White House pledge nearly two years ago: to close the prison. "There is obviously an irony here," said one Obama administration official, "but if we resort to this, it is to close Guantanamo, not keep it open." While the signing statement and the executive order would leave some room for Obama, they would do little to bring his policy goals to fruition. Over the last two years, Congress and the administration, working separately and in conflict, have woven together a complicated set of categories, policies and restrictions that make it difficult, if not impossible, to close Guantanamo. What the White House once saw as bipartisan support for shuttering the prison soon became a bipartisan effort to thwart the administration's plans. The spending measure effectively bars the president from prosecuting any detainees in federal court or conducting military commission trials on U.S. soil. The bill makes it increasingly difficult to transfer detainees to foreign countries, even if the administration deems them safe to release. And it complicates the review process Obama plans in the executive order for nearly 50 detainees the administration has designated as too dangerous to free. A small circle of policymakers and lawyers from the White House, the Justice Department and State Department spent the closing hours of 2010 considering drafts for a statement. A number of administration officials who discussed the internal deliberations declined to be identified because they were not authorized to speak on this subject. They said the statement could amount to a presidential intent to disregard some, but not all, of the provisions relating to Guantanamo detainees. Under consideration are claims that the provisions amount to "undue infringement" on the president's authority to exercise prosecutorial discretion, or that they are viewed by the White House as an "unnecessary and unwarranted intrusion," on that power. Several advisers were pushing for a broader statement that would also take issue with provisions related to detainee transfers. Obama has twice issued signing statements claiming that legislative provisions interfered with his constitutional authority to conduct foreign relations and could do so again. But there is some concern that the White House is on less firm ground in that area. The bill, while making future transfers difficult, does not ban them outright. "There is an honest debate right now, centered primarily inside the White House Counsel's office, and among a number of top staff," said one official who spoke on the condition of anonymity. "The question is: Can we work with some of this stuff and, if not, how sharply do we make that point." The president could veto the spending bill. But officials said the White House will not block legislation on military pay and benefits, especially after the military's support for repealing "Don't Ask, Don't Tell," legislation in December. Spokesmen at the White House and the National Security Council did not respond to requests for comment. The White House has, until now, balked at confrontation even as it watched its policy options dwindle. Not one administration official who spoke about the internal deliberations could say for sure whether the White House, in moving to protect the right to prosecute detainees in federal court, would in fact use it. "All presidents want to preserve maneuverability and authority, that is natural," said Elisa Massimino, president of the civil rights organization Human Rights First. "But President Obama has had the authority to move prisoners to the United States, he's done the background work to identify people to bring to justice and he's squandered the opportunities to exercise that authority. It is striking to now see a fiercer desire to preserve authority than to use it," she said. In a May 2009 speech at the National Archives, Obama laid out a pathway for dealing with the 240 detainees then held at Guantanamo . A small number would be confined indefinitely without charge or trial, but the great majority would have their status resolved by civilian or military trials or outright release. Two years later, there is no clarity on any of those tracks. No formal charges have been brought against the three dozen men designated for eventual trial. Others long cleared to return home languish in custody in part because of the administration's self-imposed moratorium on transfers to Yemen. In effect, detainees face indefinite prosecution, and indefinite release -- concepts unknown before Obama's presidency. In the interim, the number of Guantanamo inmates designated for open-ended detention has grown while the number who await trial has declined. An executive order would deal in part with some of those cases. Currently, the draft order would provide a full review process for the 48 detainees in the indefinite detention category -- suspects the administration will not charge nor free. Those detainees would have access to lawyers and could challenge their detention and some of the evidence against them. The order also envisions a review of potential prosecution cases to determine which are still viable and in what setting. But the detainees in that category and those in all other categories have no way to challenge those determinations. "If the executive order only applies to the 48 detainees that the administration says they are detaining indefinitely, then that is a failure to acknowledge reality," said Laura Pitter, a lawyer with Human Rights Watch. "There are 174 detainees still at Guantanamo and whether the administration says they will be tried, detained or released, they are in fact indefinitely detained and have been for a long time." Human Rights Watch, along with other civil rights groups, opposes indefinite detention. "The administration needs to either prosecute them or release them," Pitter said. The bill makes both of those options more difficult and complicates the aims of the executive order. Under the terms of the order, an administrative board would meet periodically to evaluate detainees case by case. The board could, in theory, approve the release of a detainee at any time. But language in the defense spending bill allows for the direct release of a detainee only through a court order. For all other releases, the administration would need to seek waivers and in some cases, additional certifications, the terms of which would not likely be achievable. As a result, the executive order review would be rendered meaningless for nearly all but a small handful of the detainees. Some officials said there have been ongoing efforts to redraft elements of the order, alongside the signing statement, to create a process consistent with the spending bill provisions. But it has been a difficult task. The bill is most at odds with the administration's longstanding intent to prosecute detainees accused of committing crimes. Its provisions prevent any detainees from being transferred to the United States for any reason, language that effectively kills plans for trials on U.S. soil. It is this provision that first raised the ire of the administration. In a sharply worded letter to Congressional leaders before the bill was passed, Attorney General Eric Holder wrote that limiting the Justice Department's options for federal court prosecutions was "an extreme and risky encroachment on the authority of the Executive branch to determine when and where to prosecute terrorist suspects." Holder specifically noted the president's authority to exercise "prosecutorial discretion." If the bill were signed without challenge, the remaining prosecutorial option left for the administration would be to charge detainees in military commissions at Guantanamo, with those convicted serving time at the facility. So far, the administration has been unwilling to bring new charges in that setting. "The bill," said one administration official, "undermines the principles outlined in the president's archives speech and there is no way to pretend you are closing Guantanamo if that law goes through unchallenged." The bill is also likely to unravel the only working leg of the administration's Guantanamo effort: transfers of some detainees home or to third countries. Mostly with the help of European allies, the State Department has transferred or resettled 66 detainees, roughly one-quarter of the detention facility's population when Obama came into office. That program is still completing transfers or returns for another 30, non-Yemeni detainees. While the bill does not prevent future transfers outright, it determines that the secretary of defense, and to some extent, the secretary of state, must ensure that any released individual cannot engage in activity harmful to the United States. Administration officials said the wording makes it all but impossible to carry out additional transfers. A recent U.S. intelligence assessment said that five detainees released during Obama's presidency have engaged in or are suspected of engaging in terrorist or insurgent activity. 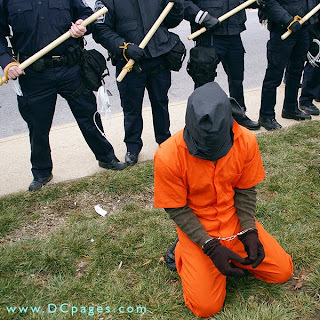 During the Bush administration, more than 500 prisoners were released and the recent report by the Director of National Intelligence said as many as 150 of those former detainees have engaged in or are suspected of participating in efforts to harm the United States. Obama has issued a number of signing statements taking issue with more than a dozen legislative provisions and has come under some criticism for it from both Republicans and Democrats. Shortly after he took office, Obama promised to use them with less frequency than former President Bush, noting in a presidential memorandum in March 2009: "I will act with caution and restraint, based only on interpretations of the Constitution that are well-founded." Bush established Guantanamo through executive order and issued over 150 signing statements, more than any other president. The practice was especially controversial when Bush applied it to legislation dealing with detainee treatment. The American Bar Association issued a report in 2006 that called signing statements "contrary to the rule of law and our constitutional separation of powers." The report was signed by a number of legal scholars including Harold Koh, who was then dean at Yale Law School and is today the top lawyer at the State Department and one of several advisers involved in the administration's Guantanamo policy.